I need suggestion on scoping my Ruger #1 in 45-70. I fought with the peep sites all weekend long and decide it is time to make the move if I am to enjoy shooting this rifle. So a question on getting a low power scope. I see Vortex has a Strike Eagle 1-6 x 24 that looks interesting, but would an AR scope work on this rifle? 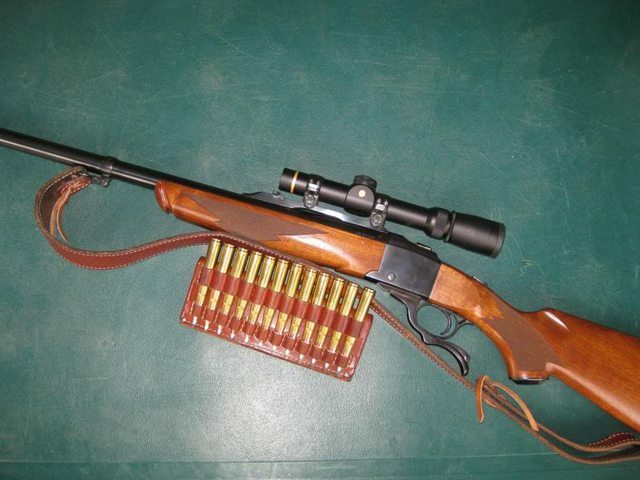 I am mainly going to use this for hunting 150 yds or less. Shooter4570, J BOBWAY, M700 and 3 others like this. What about a Vortex, Redfield, or Leupold 2-7X? I have a Leupold VX Freedom 2-7X on my Henry single shot 45-70 and it works well for me. My wife is a doctor of optometry. I get great eye care. That said, age causes things that you can't fix. Iron sights on a revolver work fine for me but are pretty much a disaster on a rifle. I like the Leupold 2-7 idea posted above. I have a VX3 on one .270 and it is superb. I have a number of Leupold 1-4x also. Red dots work for me also if I limit range. I have 7 Leupolds and have only had 1 that I shook loose shooting 12 gauge slugs. They repaired it for free.....about 10 years after I purchased it. Four of them are on slug guns so they all take a beating from recoil. My 45-70 is a toy compared to the recoil from a 12 gauge slug gun. Their new model VX- Freedom is a heck of a good deal. Like Ret Eng said, the 2-7 is a great choice out to 150 yards. I agree on the Leupold durability. I took one on mountain goat hunt when I was a young man. That scope had a tough time. I still have it and it still works great. Last edited by white cloud; 04-15-2019 at 10:32 AM. Vortex makes many different great optics, but the Strike Eagle may be way more than what you want in regard to the reticle. It depends on what distance you want to shoot it out to for a max range, but a standard duplex reticle works perfect for most. Nikon has good glass, Leupold is higher up in price, Vortex, newer Bushnell, the possibilities are endless. I'd research what you want out of the scope and narrow it down to a few options, then go to Sportsman's Warehouse or other similar store and look at them in person before making the decision. I put a 4X32 Leupold scope on my Browning model 1885, 45/70. It has over 4" eye relief, good field of view, and is a "light" 9 oz. Mine has a "dot"; I just put it on the target and press the trigger and the 45/70 does the rest. The 4X scope is made simple with less internal parts than the variables and has been used for years as my "back up" scope on many hunts. While I have a couple "low power" variables (1-4, 2-5, etc. ), I find they seem to gather less light than a scope with a larger "objective" lens. Even though my "eye pupil" probably does not have more than a 5mm opening, the 8mm opening of the 4 power scope seems to be brighter and give me more "eye box" room when putting the rifle to the shoulder. The main advantage of the "low power" variable is it has a super wide field of view at the low end that almost equals "iron" sights while providing a "single point" aiming solution, and the advantage of magnifying the target on demand. I usually forget to readjust a scope's power ring when I encounter game, so a variable is less of an advantage for me unless I'm hunting something a "arms length" where I do not want to magnify target and I need that feature right now! My choice is but one solution, good luck with yours. I just put a Leupold 1.5-5x20 on my Marlin 1895 Cowboy for the same reasons you're looking to scope that #1. My Leupold has the #4 German reticle which I really like in low light conditions. I went with that scope for the '95 because I didn't want a ginormous scope on that lever gun (I'm getting used to scopes on levers). I have a similar scope on my 6.5x55 Swede #1A. I disremember the magnification at this time, but it's either 2-7X or 3-9X. One of the issues with a Number One is getting the eye relief right. With most of my rifles I shove the scope far forward, but with the Number One... I pull 'em all the way back in the rings and some scopes still don't come back far enough for proper eye relief! Ruger does make a ring that compensates for this, I believe it lets the scope be moved back another 3/4" or so. Might only be avail in medium height, not sure. I've had different scopes on my 375 H&H Number One. My favorite is this one, a 1.5-5x Leupold, which is mounted as far back as I can get it. It's just about perfect for me and my shooting. I've used this combo bear hunting, and have shot bears at 300 yards and also at 15 feet. A scope with ample eye relief and a good "eye box" is important. Prickle Farmer, mrguvna, Arkie and 1 others like this. Oh - if you haven't run into this before, it may be disconcerting. At low powers the front sight will be visible when looking through your scope! This can be distracting at first. Learn to ignore it. It doesn't bother me anymore, but at first it did.